During the 1930s and ’40s, neon signs gave a distinct sense of glamour. As neon became cheaper and readily available, cities became illuminated in a unique way. However, it took a few decades for the medium to become a fascinating subject for artists. 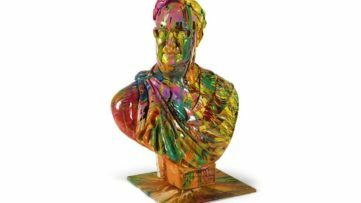 In the late 1950s and ’60s, the material first moved into the cultural conversation, blurring the divide between the new consumerism and art. Andy Warhol, the master of Pop Art, called the material one of “the great modern things“. A range of the 1960s and 1970s artists pushed the boundaries of the medium, from Joseph Kosuth who created neon-lit text pieces that pushed conceptions of art, to Dan Flavin who created minimal light installations that moved beyond text and representational pieces. Neon has remained an integral part of the vernacular fabric of the commercial, the contemporary and the urban. The use of neon in contemporary art prevails, indicative of artists’ interests in considering and representing contemporary everyday life. 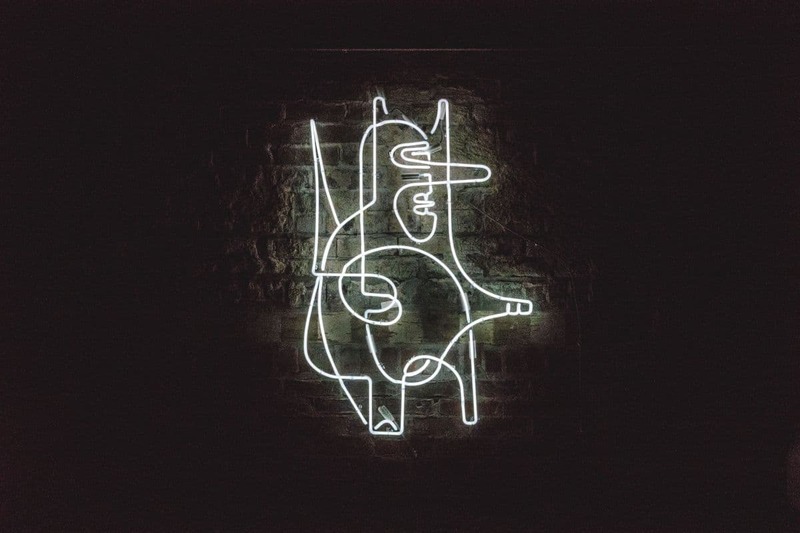 Through the work of a range of contemporary neon artists, the medium continues to take on more expanded and elusive meanings. 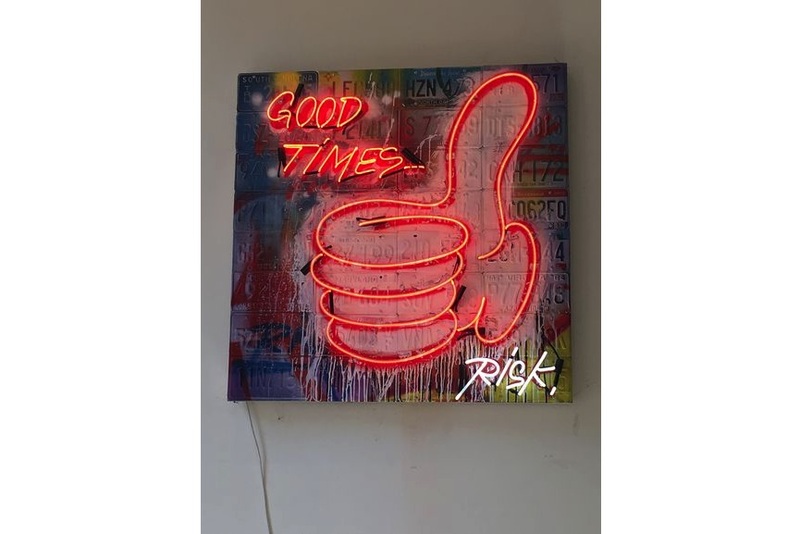 We bring you a selection of neon works of art that can enlighten your wall right now. Featured image: Doze Green – Archons 2, 2017. All images courtesy of their respective galleries. A French multidisciplinary artist, Frederic Garnier has a diverse practice that encompasses sculpture, installation, photography, video art and drawing. No matter which medium he works in, Garnier is concerned with the quest for the meaning of human existence, exploration of time and our relativity to it. 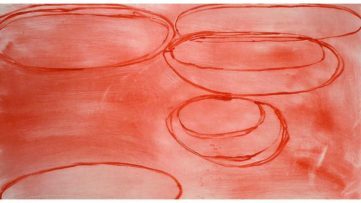 His works reveal that humans’ egocentric connection with time only highlights our vulnerability and transience. 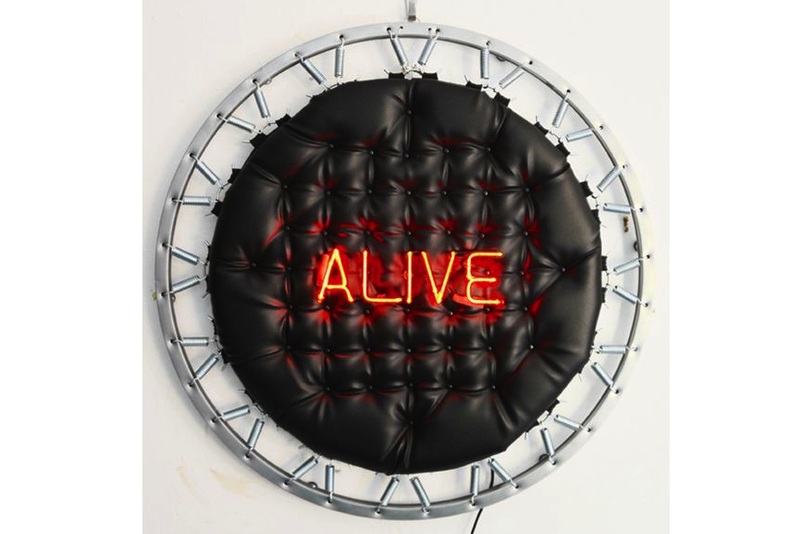 Created using trampoline, imitation leather and pyrex neon light, the installation Alive deals with the ephemerality of human existence and the search for meaning. Known as “the bad girl of British art”, the artist Tracey Emin is known for numerous series of provocative and controversial art pieces, from paintings and textiles to sculpture and video, often exploring her troubled childhood and teenage years. Exposing personal details of her life in a candid and humorous way, she creates work that is intensely personal. 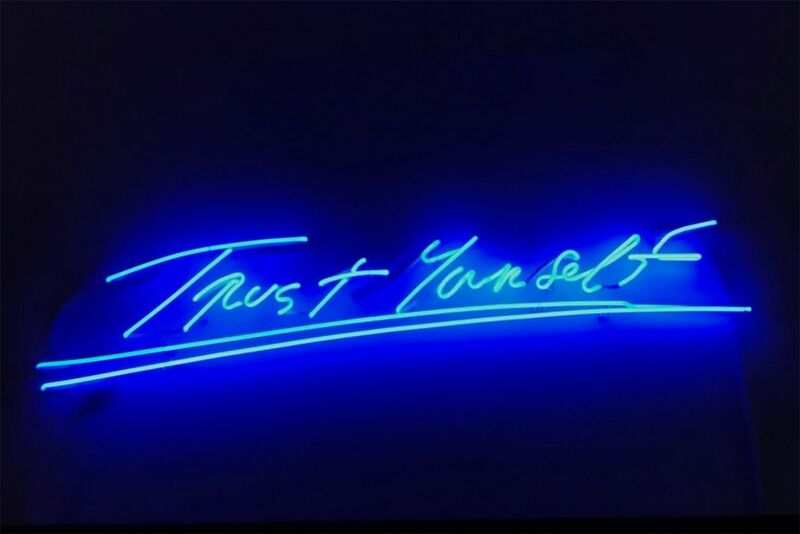 As all of her neon works, the installation Trust Yourself from 2012 is created in her handwriting, evoking notes written to herself or scrawled in the margins of a sketchbook. Translated into a glowing industrial sign, the psychological reminder gains a new level of importance. 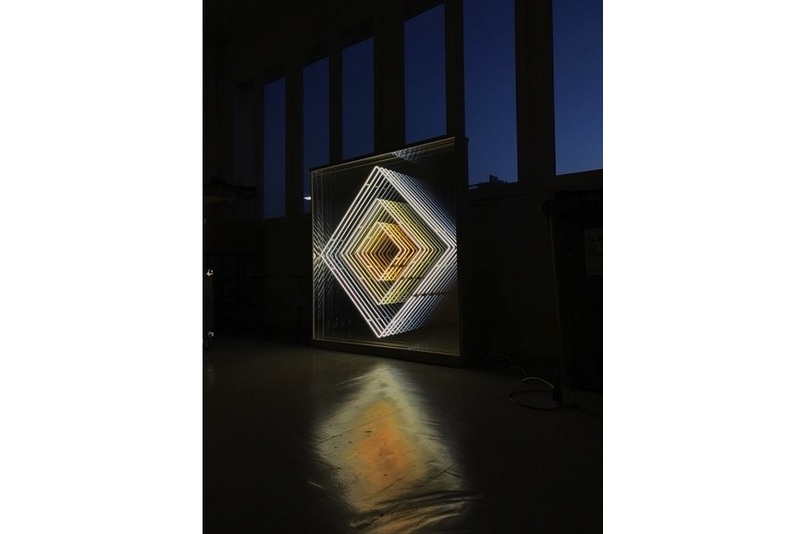 A French visual artist, Emmanuelle Rybojad uses supports such as mirrors, neon lights, LED, Plexiglas and plays with them to go beyond their basic use. Producing mosaics with Rubik’s cubes, infinity neon diamonds, geometric shapes created out of an assembly of mirrors, the artist takes the viewers on a journey into the world of illusion, making them question what they see and perceive. The installation Neon Champagne en sycomore is an assembly of squares of various sizes made out of neon tubes. The work creates an illusion of infinite depth. 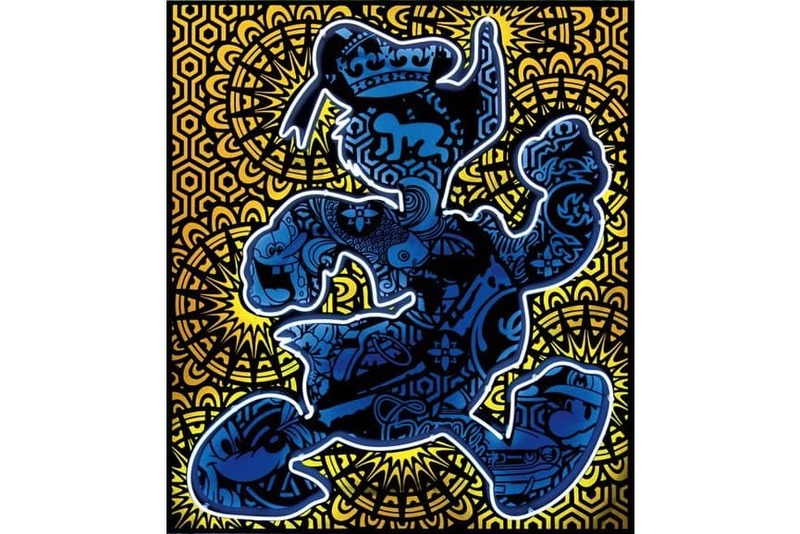 Recognized as one of the most influential figures in the French Street Art movement, Speedy Graphito creates works that are striking, vigorous, and controversial. His distinct, inimitable style addresses the consumer seduction while referencing pop culture icons and street art influences. In the work Donal Neon, the artist appropriates the popular cultural icon od Donald Duck, rendering it in vivid colors and neon outlines. One of the pioneers of the street art movement, Doze Green stands out as one of the most important figures of the American Contemporary Art. Blending figurative abstraction, fluid line work and organic cubism, he creates characters and elements portrayed in a state of flux. This neon acrylic mounting is part of the Archons series presented in The Divine Sparks Project for The Unexpected Project. It is based on a philosophical understanding that our most powerful sense of meaning comes as encounters between past and future, between object and substance, between the spark and the divine. Encompassing mural work, neon art installation, video projection, quartet orchestra and 3D animation, the project is conceived as both discovery and recovery. One of the biggest names in the street art and graffiti scene in the United States, RISK aka Kelly Graval is a living legend whose career spans over 30 years. He rose to prominence by pushing the boundaries of graffiti with his unique letterforms. 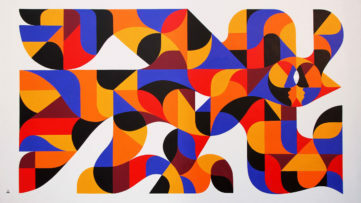 Still involved in graffiti and continuing to develop his abstract letterforms, he started moving towards and abstraction of color and an exploration of a range of mediums. Using aerosol on license plates and combining it with neon, the artist has created a piece of great visual impact.